While a pro about Marketo is its robust platform and tools, a con is that it takes significantly more time to understand and become highly knowledgeable about the platform. Marketo is pretty pricey compared to other platforms like HubSpot, and additional functionality/features within Marketo seems to come at a higher price. The reports are pretty basic and not as visually appealing as other auto-generated reports in competitor platforms like HubSpot. Marketo has the robust reporting, triggers, and filters to meet our business needs. Marketo is best used for enterprise companies with large Marketing staffs who can attend to the multiple needs of the platform. A developer and designer are best to maximize the use of the platform. Marketo has never been unavailable that I've seen other than regularly scheduled maintenance which is announced in advance. Pages do not load quickly and caching is not available with Marketo. Google PageSpeed ranks it pretty low, which is something I'm hoping they'll improve in future releases. Some support reps are great, and others don't help at all. Calling the phone line is useless. I took in-person training at their annual summit and loved the exposure it gave me to other Marketing users. I had never used Marketo prior to taking this job so online training was my starting point. I was able to follow along, it was interesting and quickly and efficiently taught me what I needed to know without a lot of fluff. It was far from boring and really helped me get my hands dirty with Marketo. Find someone who gets Marketing and is also tech savvy. You need a combination of these skills in your implementation partner. Our firm very purposefully keeps up with several competing technologies so we can provide a wide, platform agnostic view of the marketplace. We partner with those companies that "wow" us. Allocadia is not a full blown MOPS software with Workflow, DAM, etc. 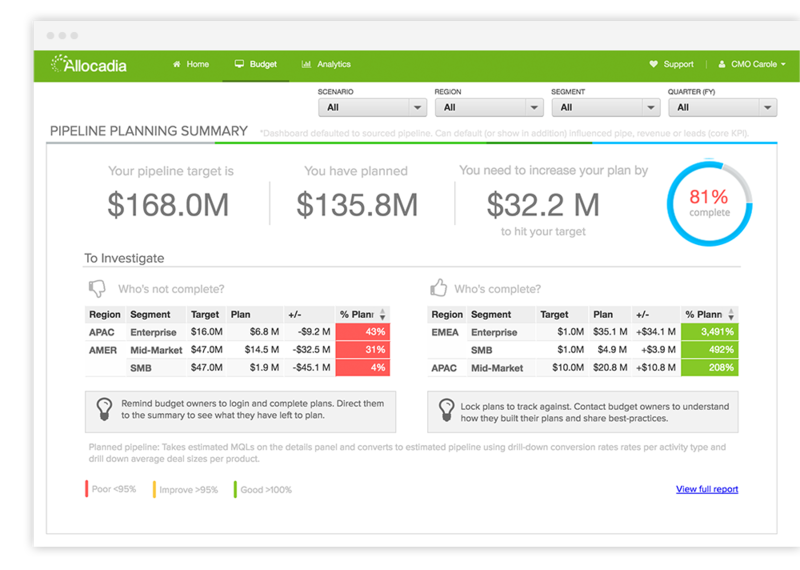 Allocadia nails Marketing Performance Management--a pain point for most companies--by bringing the budgeting, planning, and tracking of marketing spend to an online, collaborative platform. They are the market leader for a reason, their integrations are fully developed and they do the job well. Pardot and MailChimp suffer from lack of development in automation. We have noticed performance issues when large jobs are submitted. Typically involving imports or massive data changes but we've noticed slowdowns and bottlenecks. Increased efficiency in budget tracking, proper coding, approval process, making sure finance actuals match marketing actuals. Marketo has definitely helped with efficiency. We moved from another program where we had to upload lists and could only do them in batches of so many at a time. This and many other factors have made us more efficient! Marketo has helped us with our tracking of leads through the entire funnel. We can now go from an anonymous lead just looking at our website all the way through to closed business. We can also then loop it around again to use our lead process for upsell opportunities which is critical in today's market. Marketo has had a huge impact on us because of its ability to integrate with our CRM. We can now work with sales and customer service to ensure that we have the correct contacts and there is seamless integration to offer them the visibility into what a contact has received. 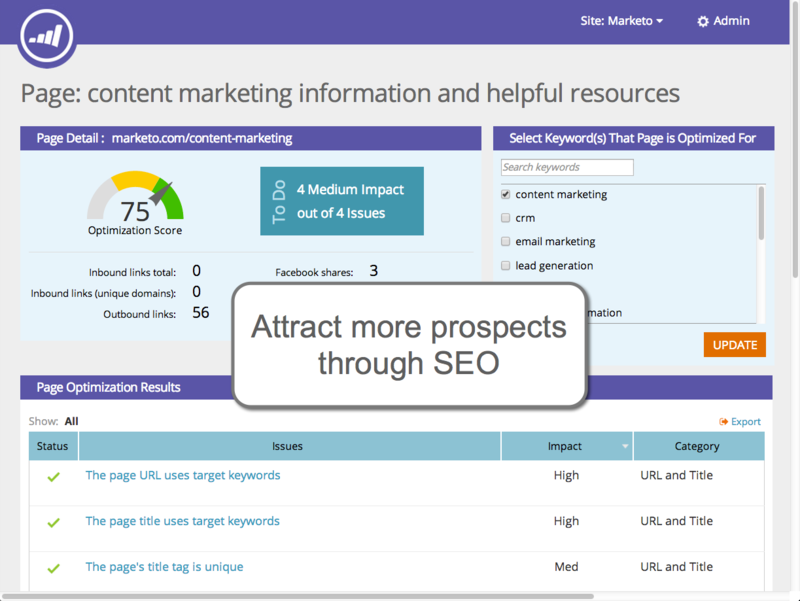 Marketo SEO - Marketo helps you generate demand via SEO through search marketing, landing pages and forms, social marketing, and website visitor tracking.